When it comes to straightening your teeth, things don’t get any easier than Invisalign. You just pop your aligners in and get on with your life, right? Sugar Hill GA orthodontists say this is mostly true. Invisalign does make your life easier during the orthodontic process, but it is important that you take a certain degree of responsibility to ensure your own success. Keep a travel toothbrush on hand. A spare toothbrush and travel-sized toothpaste will make it easier for you to brush after meals, even if you are on the go. If brushing isn’t possible, rinse your mouth with lots of water or chew a piece of sugarless gum, but remember to put your aligners back in as soon as possible. Your aligners need to be worn for a minimum of 22 hours every day! Change your aligners at night. You will transition to a new set of aligners every 1-2 weeks. This is not typically a painful process, but you may need a little time to adjust to your new aligners. Getting comfortable with the fit or feel of your trays will be less of a distraction at night than during the day. Don’t lose your aligners. During meals, place your aligners in their case for safe-keeping. Wrapping them in a napkin is not recommended as you are likely to throw them away by accident. Lost aligners can be replaced, but they can take several days to be delivered. The waiting time without your aligners could cause a huge setback in your progress. Choose water. It’s okay to have a drink while you are wearing your aligners, but some beverages can cause unwanted problems. Hot drinks such as coffee or tea could warp or distort your aligners, affecting the proper movement of your teeth. Red wine and fruit juices can stain your aligners. Plus, the natural sugars can lead to cavities! Don’t skip the retainer. 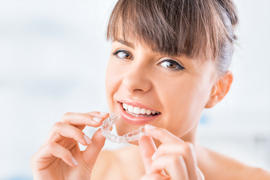 Retainers are as important as the aligners when it comes to protecting your new smile. Your teeth can shift in a matter of hours or days without the reinforcement of a custom retainer. Sugar Hill orthodontists are excited about what Invisalign can do for your smile. For more details, call to schedule an appointment today.